The Comintern held seven World Congresses in Moscow between 1919 and 1935. During that period, it also conducted thirteen Enlarged Plenums of its governing Executive Committee, which had much the same function as the somewhat larger and more grandiose Congresses. The Comintern was officially dissolved by Joseph Stalin in 1943 to avoid antagonizing its allies the United States and the United Kingdom. While the differences had been evident for decades, World War I proved the issue that finally divided the revolutionary and reformist wings of the workers' movement. The Triple Alliance comprised two empires while the Triple Entente gathered France and Britain into an alliance with Russia. Socialists had historically been anti-war and internationalist, fighting against what they perceived as militarist exploitation of the proletariat for bourgeois states. A majority of socialists voted in favor of resolutions for the Second International to call upon the international working class to resist war if it were declared. Despite this, after the beginning of World War I many European socialist parties announced support for their respective nations. Some exceptions were the socialist parties of the Balkans and the British Labour Party. To Vladimir Lenin's surprise, even the Social Democratic Party of Germany voted in favor of war. The assassination of the influential anti-war French Socialist Jean Jaurès on 31 July 1914 cemented the socialist parties support for their government of national unity. Socialist parties in neutral countries mostly supported neutrality rather than total opposition to the war. On the other hand, during the 1915 Zimmerwald Conference, Lenin organized an opposition to the "imperialist war" as the Zimmerwald Left, publishing the pamphlet Socialism and War where he called socialists collaborating with their national governments social chauvinists, i.e. socialists in word, but nationalists in deed. The Zimmerwald Left produced no practical advice for how to initiate socialist revolt. The Second International divided into a revolutionary left-wing, a moderate center-wing, and a more reformist right-wing. Lenin condemned much of the center as "social pacifists" for several reasons, including their vote for war credits despite publicly opposing the war. Lenin's term "social pacifist" aimed in particular at Ramsay MacDonald, leader of the Independent Labour Party in Britain, who opposed the war on grounds of pacifism but did not actively fight against it. Discredited by its apathy towards world events, the Second International dissolved in 1916. In 1917, Lenin published the April Theses which openly supported revolutionary defeatism, where the Bolsheviks hoped that Russia would lose the war so that they could quickly cause a socialist insurrection. The victory of the Russian Communist Party in the Bolshevik Revolution of November 1917 was felt throughout the world and an alternative path to power to parliamentary politics was demonstrated. With much of Europe on the verge of economic and political collapse in the aftermath of the carnage of World War I, revolutionary sentiments were widespread. The Russian Bolsheviks headed by Lenin believed that unless socialist revolution swept Europe, they would be crushed by the military might of world capitalism just as the Paris Commune had been crushed by force of arms in 1871. The Bolsheviks believed that this required a new international to foment revolution in Europe and around the world. The Comintern was founded at a Congress held in Moscow on 2–6 March 1919. It opened with a tribute to Karl Liebknecht and Rosa Luxemburg, recently murdered by the Freikorps during the Spartakus Uprising. against the backdrop of the Russian Civil War. There were 52 delegates present from 34 parties. They decided to form an Executive Committee with representatives of the most important sections and that other parties joining the International would have their own representatives. The Congress decided that the Executive Committee would elect a five-member bureau to run the daily affairs of the International. However, such a bureau was not formed and Lenin, Leon Trotsky and Christian Rakovsky later delegated the task of managing the International to Grigory Zinoviev as the Chairman of the Executive. Zinoviev was assisted by Angelica Balabanoff, acting as the secretary of the International, Victor L. Kibaltchitch[note 1] and Vladmir Ossipovich Mazin. Lenin, Trotsky and Alexandra Kollontai presented material. The main topic of discussion was the difference between bourgeois democracy and the dictatorship of the proletariat. Zinoviev served as the first Chairman of the Comintern's Executive Committee from 1919 to 1926, but its dominant figure until his death in January 1924 was Lenin, whose strategy for revolution had been laid out in What Is to Be Done? (1902). The central policy of the Comintern under Lenin's leadership was that communist parties should be established across the world to aid the international proletarian revolution. The parties also shared his principle of democratic centralism (freedom of discussion, unity of action), namely that parties would make decisions democratically, but uphold in a disciplined fashion whatever decision was made. In this period, the Comintern was promoted as the general staff of the world revolution. Ahead of the Second Congress of the Communist International, held in July through August 1920, Lenin sent out a number of documents, including his Twenty-one Conditions to all socialist parties. The Congress adopted the 21 conditions as prerequisites for any group wanting to become affiliated to the International. The 21 Conditions called for the demarcation between communist parties and other socialist groups[note 3] and instructed the Comintern sections not to trust the legality of the bourgeois states. They also called for the build-up of party organisations along democratic centralist lines in which the party press and parliamentary factions would be under the direct control of the party leadership. Regarding the political situation in the colonized world, the Second Congress of the Communist International stipulated that a united front should be formed between the proletariat, peasantry and national bourgeoisie in the colonial countries. Amongst the twenty-one conditions drafted by Lenin ahead of the congress was the 11th thesis which stipulated that all communist parties must support the bourgeois-democratic liberation movements in the colonies. Notably, some of the delegates opposed the idea of alliance with the bourgeoisie and preferred giving support to communist movements in these countries instead. Their criticism was shared by the Indian revolutionary M. N. Roy, who attended as a delegate of the Mexican Communist Party. The Congress removed the term bourgeois-democratic in what became the 8th condition. Many European socialist parties divided because of the adhesion issue. The French Section of the Workers International (SFIO) thus broke away with the 1920 Tours Congress, leading to the creation of the new French Communist Party (initially called French Section of the Communist International – SFIC). The Communist Party of Spain was created in 1920, the Communist Party of Italy was created in 1921, the Belgian Communist Party in September 1921 and so on. Writings from the Third Congress, held in June–July 1921, talked about how the struggle could be transformed into civil war when the circumstances were favorable and openly revolutionary uprisings. The Fourth Congress, held in November 1922, at which Trotsky played a prominent role, continued in this vein. The Dungan commander of the Dungan Cavalry Regiment Magaza Masanchi attended the Third Congress. During this early period, known as the First Period in Comintern history, with the Bolshevik Revolution under attack in the Russian Civil War and a wave of revolutions across Europe, the Comintern's priority was exporting the October Revolution. Some communist parties had secret military wings. One example is the M-Apparat of the Communist Party of Germany. Its purpose was to prepare for the civil war the Communists believed was impending in Germany and to liquidate opponents and informers who might have infiltrated the party. There was also a paramilitary organization called the Rotfrontkämpferbund. The Comintern was involved in the revolutions across Europe in this period, starting with the Hungarian Soviet Republic in 1919. Several hundred agitators and financial aid were sent from the Soviet Union and Lenin was in regular contact with its leader Béla Kun. Soon, an official Terror Group of the Revolutionary Council of the Government was formed, unofficially known as Lenin Boys. The next attempt was the March Action in Germany in 1921, including an attempt to dynamite the express train from Halle to Leipzig. After this failed, the Communist Party of Germany expelled its former chairman Paul Levi from the party for publicly criticising the March Action in a pamphlet, which was ratified by the Executive Committee of the Communist International prior to the Third Congress. A new attempt was made at the time of the Ruhr crisis in spring and then again in selected parts of Germany in the autumn of 1923. The Red Army was mobilized, ready to come to the aid of the planned insurrection. Resolute action by the German government cancelled the plans, except due to miscommunication in Hamburg, where 200–300 Communists attacked police stations, but were quickly defeated. In 1924, there was a failed coup in Estonia by the Estonian Communist Party. In 1924, the Mongolian People's Revolutionary Party joined Comintern. At first, in China both the Communist Party of China and the Kuomintang were supported. After the definite break with Chiang Kai-shek in 1927, Joseph Stalin sent personal emissaries to help organize revolts which at this time failed. Lenin died in 1924 and the next year saw a shift in the organization's focus from the immediate activity of world revolution towards a defence of the Soviet state. In that year, Stalin took power in Moscow and upheld the thesis of socialism in one country, detailed by Nikolai Bukharin in his brochure Can We Build Socialism in One Country in the Absence of the Victory of the West-European Proletariat? (April 1925). The position was finalized as the state policy after Stalin's January 1926 article On the Issues of Leninism. Stalin made the party line clear: "An internationalist is one who is ready to defend the USSR without reservation, without wavering, unconditionally; for the USSR it is the base of the world revolutionary movement, and this revolutionary movement cannot be defended and promoted without defending the USSR". The dream of a world revolution was abandoned after the failures of the Spartacist uprising in Germany and of the Hungarian Soviet Republic and the failure of all revolutionary movements in Europe such as in Italy, where the fascist squadristi broke the strikes and quickly assumed power following the 1922 March on Rome. This period up to 1928 was known as the Second Period, mirroring the shift in the Soviet Union from war communism to the New Economic Policy. At the Fifth World Congress of the Comintern in July 1924, Zinoviev condemned Marxist philosopher Georg Lukács's History and Class Consciousness, published in 1923 after his involvement in Béla Kun's Hungarian Soviet Republic and Karl Korsch's Marxism and Philosophy. Zinoviev himself was dismissed in 1926 after falling out of favor with Stalin. Bukharin then led the Comintern for two years until 1928, when he too fell out with Stalin. Bulgarian Communist leader Georgi Dimitrov headed the Comintern in 1934 and presided until its dissolution. By the Fifth Comintern Congress in July 1924 [...] the collapse of Communist support in Europe tightened the pressure for conformity. A new policy of "Bolshevization" was adopted, which dragooned the CPs toward stricter bureaucratic centralism. This flattened out the earlier diversity of radicalisms, welding them into a single approved model of Communist organization. Only then did the new parties retreat from broader Left arenas into their own belligerent world, even if many local cultures of broader cooperation persisted. Respect for Bolshevik achievements and defense of the Russian Revolution now transmuted into dependency on Moscow and belief in Soviet infallibility. Depressing cycles of "internal rectification" began, disgracing and expelling successive leaderships, so that by the later 1920s many founding Communists had gone. This process of coordination, in a hard-faced drive for uniformity, was finalized at the next Congress of the Third International in 1928. The Comintern was a relatively small organization, but it devised novel ways of controlling communist parties around the world. In many places, there was a communist subculture, founded upon indigenous left-wing traditions which had never been controlled by Moscow. The Comintern attempted to establish control over party leaderships by sending agents who bolstered certain factions, by judicious use of secret funding, by expelling independent-minded activists and even by closing down entire national parties (such as the Communist Party of Poland in 1938). Above all, the Comintern exploited Soviet prestige in sharp contrast to the weaknesses of local parties that rarely had political power. Communist front organizations were set up to attract non-members who agreed with the party on certain specific points. Opposition to fascism was a common theme in the popular front era of the mid 1930s. The well-known names and prestige of artists, intellectuals and other fellow travelers were used to advance party positions. They often came to the Soviet Union for propaganda tours praising the future. Under the leadership of Zinoviev, the Comintern established fronts in many countries in the 1920s and after. To coordinate their activities, the Comintern set up international umbrella organizations linking groups across national borders, such as the Young Communist International (youth), Profintern (trade unions), Krestintern (peasants), International Red Aid (humanitarian aid), Sportintern (organized sports) and more. Front organizations were especially influential in France, which in 1933 became the base for communist front organizer Willi Münzenberg. These organizations were dissolved in the late 1930s or early 1940s. In 1928, the Ninth Plenum of the Executive Committee began the so-called Third Period, which was to last until 1935. The Comintern proclaimed that the capitalist system was entering the period of final collapse and therefore all communist parties were to adopt an aggressive and militant ultra-left line. In particular, the Comintern labelled all moderate left-wing parties social fascists and urged the communists to destroy the moderate left. With the rise of the Nazi movement in Germany after 1930, this stance became controversial. The Sixth World Congress also revised the policy of united front in the colonial world. In 1927, the Kuomintang had turned on the Chinese Communists, which led to a review of the policy on forming alliances with the national bourgeoisie in the colonial countries. The Congress did make a differentiation between the character of the Chinese Kuomintang on one hand and the Indian Swarajist Party and the Egyptian Wafd Party on the other, considering the latter as an unreliable ally yet not a direct enemy. The Congress called on the Indian Communists to utilize the contradictions between the national bourgeoisie and the British imperialists. The Seventh and last Congress of the Comintern was held between 25 July 25 and 20 August 1935. It was attended by representatives of 65 communist parties. The main report was delivered by Dimitrov, other reports were delivered by Palmiro Togliatti, Wilhelm Pieck and Dmitry Manuilsky. The Congress officially endorsed the popular front against fascism. This policy argued that communist parties should seek to form a popular front with all parties that opposed fascism and not limit themselves to forming a united front with those parties based in the working class. There was no significant opposition to this policy within any of the national sections of the Comintern. In France and Spain, it would have momentous consequences with Léon Blum's 1936 election which led to the Popular Front government. Stalin's purges of the 1930s affected Comintern activists living in both the Soviet Union and overseas. At Stalin's direction, the Comintern was thoroughly infused with Soviet secret police and foreign intelligence operatives and informers working under Comintern guise. One of its leaders, Mikhail Trilisser, using the pseudonym Mikhail Aleksandrovich Moskvin, was in fact chief of the foreign department of the Soviet OGPU (later the NKVD). At Stalin's orders, 133 out of 492 Comintern staff members became victims of the Great Purge. Several hundred German communists and antifascists who had either fled from Nazi Germany or were convinced to relocate in the Soviet Union were liquidated and more than a thousand were handed over to Germany. Fritz Platten died in a labor camp and the leaders of the Indian (Virendranath Chattopadhyaya or Chatto), Korean, Mexican, Iranian and Turkish communist parties were executed. Out of 11 Mongolian Communist Party leaders, only Khorloogiin Choibalsan survived. Leopold Trepper recalled these days: "In house, where the party activists of all the countries were living, no-one slept until 3 o'clock in the morning. [...] Exactly 3 o'clock the car lights began to be seen [...] we stayed near the window and waited [to find out], where the car stopped". The historical role of the Communist International, organized in 1919 as a result of the political collapse of the overwhelming majority of the old pre-war workers' parties, consisted in that it preserved the teachings of Marxism from vulgarisation and distortion by opportunist elements of the labor movement. 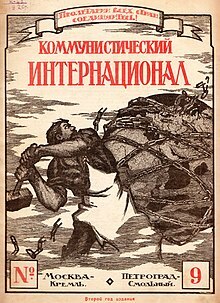 But long before the war it became increasingly clear that, to the extent that the internal as well as the international situation of individual countries became more complicated, the solution of the problems of the labor movement of each individual country through the medium of some international centre would meet with insuperable obstacles. After endorsements of the declaration were received from the member sections, the International was dissolved. Usually, it is asserted that the dissolution came about as Stalin wished to calm his World War II allies (particularly Franklin D. Roosevelt and Winston Churchill) and keep them from suspecting the Soviet Union of pursuing a policy of trying to foment revolution in other countries. The Research Institutes 100 and 205 worked for the International and later were moved to the International Department of the Central Committee of the Communist Party of the Soviet Union, founded at roughly the same time that the Comintern was abolished in 1943, although its specific duties during the first several years of its existence are unknown. Following the June 1947 Paris Conference on Marshall Aid, Stalin gathered a grouping of key European communist parties in September and set up the Cominform, or Communist Information Bureau, often seen as a substitute to the Comintern. It was a network made up of the communist parties of Bulgaria, Czechoslovakia, France, Hungary, Italy, Poland, Romania, the Soviet Union and Yugoslavia (led by Josip Broz Tito, Yugoslavia was expelled in June 1948). The Cominform was dissolved in 1956 following Stalin's 1953 death and the 20th Congress of the Communist Party of the Soviet Union. While the communist parties of the world no longer had a formal international organization, they continued to maintain close relations with each other through a series of international forums. In the period directly after the Comintern's dissolution, periodical meetings of communist parties were held in Moscow. Moreover, World Marxist Review, a joint periodical of the communist parties, played an important role in coordinating the communist movement up to the break-up of the Socialist Bloc in 1989–1991. The OMS (Russian: Отдел международной связи, otdel mezhdunarodnoy svyazi, ОМС), also known in English as the International Liaison Department (1921–1939), was the most secret department of the Comintern. It has also been translated as the Illegal Liaison Section and Foreign Liaison Department. ^ Kibaltchitch would later take the name Victor Serge. A former anarchist, he was not even a member of the RCP(b) at the time. He believed he was included because of his knowledge of European languages. ^ For example, the thirteenth condition stated: "The communist parties of those countries in which the communists can carry out their work legally must from time to time undertake purges (re-registration) of the membership of their party organisations in order to cleanse the party systematically of the petty-bourgeois elements within it". The term purge has taken on very negative connotations because of the Great Purge of the 1930s, but in the early 1920s the term was more ambiguous. See J. Arch Getty's Origins of the Great Purges: The Soviet Communist Party Reconsidered, 1933–1938 at p. 41 for discussion of the ambiguities in the term, including its use in the 1920 Comintern resolution. ^ Fisher, Harold Henry (1955). The Communist Revolution: An Outline of Strategy and Tactics. Stanford UP. p. 13. ^ North, David; Kishore, Joe (2008). The Historical & International Foundations of the Socialist Equality Party. Mehring Books. p. 13. ^ Tucker, Spencer C. (2005). The Encyclopedia of World War I: A Political, Social, and Military History. ABC-CLIO. pp. 883–85. ^ R. Craig Nation (1989). War on War: Lenin, the Zimmerwald Left, and the Origins of Communist Internationalism. Duke University Press. ^ Rees, Tim; Thorpe, Andrew (1998). International Communism and the Communist International, 1919–43. Manchester University Press. pp. 15–21. ISBN 9780719055461. ^ Service. Lenin: A Biography. p. 262. ^ Berg, Nils J. (1982). I kamp för Socialismen – Kortfattad framställning av det svenska kommunistiska partiets historia 1917–1981. ^ Stockholm: Arbetarkultur. p. 19. ^ a b "Glossary of Events: Congresses of the Communist International". marxists.org. ^ Serge, Victor. Memoirs of a Revolutionary. ^ Blunden, Andy. "History of the Communist International". marxists.org. ^ "First Congress of the Communist International". ^ Lenin, V. (1906). Report on the Unity Congress of the R.S.D.L.P. ^ M.V.S. Koteswara Rao. Communist Parties and United Front – Experience in Kerala and West Bengal. Hyderabad: Prajasakti Book House, 2003. pp. 48, 84–85. ^ The Black Book of Communism pp. 275–276; Minutes of the Seventh Session. ^ Joseph L. Wieczynski (1994). The Modern encyclopedia of Russian and Soviet history, Volume 21. Academic International Press. p. 125. ISBN 0-87569-064-5. Retrieved 1 January 2011. ^ The Black Book of Communism. pp. 282. Marxist Internet Archive. ^ Broue, P. (2006) The German Revolution: 1917–1923, Chicago: Haymarket Books, p. 516. ^ Broue, P. (2006) The German Revolution: 1917–1923, Chicago: Haymarket Books, p. 531. ^ The Black Book of Communism. pp. 277–278. ^ The Black Book of Communism. pp. 278–279. ^ The Black Book of Communism. pp. 280–282. ^ David Priestland, Of the Read Flag: A History of Communism (2009) p. 124. ^ Duncan Hallas The Comintern, chapter 5. ^ Geoff Eley, Forging Democracy: The History of the Left in Europe, 1850–2000 (Oxford University Press 2002). p. 228. ^ Robert Service, Comrades! : a history of world communism (2007) pp. 164–173. ^ Archie Brown, The Rise and Fall of Communism (2011) pp. 88–89. ^ Michael David‐Fox, "The Fellow Travelers Revisited: The 'Cultured West' through Soviet Eyes," Journal of Modern History (2003) 75#2 pp. 300–335 in JSTOR. ^ Robert Service, Comrades! : a history of world communism (2007) pp. 173–174. ^ Ian Birchall, "Profintern: Die Rote Gewerkschaftsinternationale 1920–1937," Historical Materialism, 2009, Vol. 17, Issue 4, pp 164–176, review (in English) of a German language study by Reiner Tosstorff. ^ Julian Jackson, The Popular Front in France (1990) p. x. ^ Duncan Hallas The Comintern, chapter 6; Nicholas N. Kozlov, Eric D. Weitz "Reflections on the Origins of the 'Third Period': Bukharin, the Comintern, and the Political Economy of Weimar Germany" Journal of Contemporary History, Vol. 24, No. 3 (Jul., 1989), pp. 387–410 JSTOR. ^ M.V.S. Koteswara Rao. Communist Parties and United Front – Experience in Kerala and West Bengal. Hyderabad: Prajasakti Book House, 2003. pp. 47–48. ^ Institute of Marxism-Leninism of the CPCz CC, Institute of Marxism-Leninism of the CPS CC. An Outline of the History of the CPCz. Prague: Orbis Press Agency, 1980. p. 160. ^ The Black Book of Communism. p. 298–301. ^ "Dissolution of the Communist International". marxists.org. ^ Robert Service, Stalin. A biography. (Macmillan – London, 2004), pp. 444–445. ^ Mark Kramer, The Role of the CPSU International Department in Soviet Foreign Relations and National Security Policy, Soviet Studies, Vol. 42, No. 3 (Jul., 1990), pp. 429–446. ^ "H-Net Discussion Networks". h-net.msu.edu. ^ Stalin and the Cold War in Europe: The Emergence and Development of East-West Conflict, 1939–1953. ^ a b McKnight, David (2012). Espionage and the Roots of the Cold War: The Conspiratorial Heritage. Routledge. pp. vii (Rudnik), 52 (Trilisser), 60 (OMS), 61–62 (dissolution), 119–120 (Ducroux, Rudnik). ^ Lazitch, Branko; Milorad M. Drachkovitch (1986). Biographical Dictionary of the Comintern. Hoover Press. pp. xxix (description), 120 (Flieg), 319 (Mirov-Abramov), 479 (Trilisser). ^ Krivitsky, Walter (2013) . In Stalin's Secret Service: An Expose of Russia's Secret Polices by the Formem Chief of the Soviet Intelligence in Western Europe. Harper & Brothers (Enigma Books). p. 125. ^ a b Sakmyster, Thomas L. (2011). Red Conspirator: J. Peters and the American Communist Underground. University of Illinois Press. pp. 37 (translation), 38 (organization), 40 (Browder), 62 (Russian counterpart), 63 (process). ^ West, Nigel (2015). Historical Dictionary of International Intelligence. Rowman & Littlefield. p. 77. ^ "The Communist International (1919–1943)". Marxist History. Retrieved March 22, 2010. Chase, William J. Enemies within the Gates? The Comintern and the Stalinist Repression, 1934–1939. New Haven, CT: Yale University Press, 2001. Dullin, Sabine, and Brigitte Studer. "Communism+ transnational: the rediscovered equation of internationalism in the Comintern years." Twentieth Century Communism 14.14 (2018): 66-95. Haithcox, John Patrick. Communism and nationalism in India: MN Roy and Comintern policy, 1920–1939 (1971). Hopkirk, Peter. Setting the East Ablaze: Lenin's Dream of a Empire in Asia 1984 (1984). James, C.L.R., World Revolution 1917–1936: The Rise and Fall of the Communist International. (1937). Duke University Press, 2017. Lazitch, Branko and Milorad M. Drachkovitch. Biographical dictionary of the Comintern (2nd ed. 1986). McDermott, Kevin. "The History of the Comintern in Light of New Documents," in Tim Rees and Andrew Thorpe (eds. ), International Communism and the Communist International, 1919–43. Manchester, England: Manchester University Press, 1998. McDermott, Kevin. "Rethinking the Comintern: Soviet Historiography, 1987–1991," Labour History Review, vol. 57, no. 3 (Wintern 1992), pp 37–58. Melograni, Piero. Lenin and the Myth of World Revolution: Ideology and Reasons of State 1917–1920, Humanities Press, 1990. Smith, S. A. (ed.) The Oxford Handbook of the History of Communism (2014) ch 10 on Commintern. Ulam, Adam B. Expansion and Coexistence: Soviet Foreign Policy, 1917–1973. Second Edition. New York: Praeger Publishers, 1974. Worley, Matthew et al. (eds.) Bolshevism, Stalinism and the Comintern: Perspectives on Stalinization, 1917–53. (2008). The Comintern and its Critics (Special issue of Revolutionary History Volume 8, no 1, Summer 2001). Davidson, Apollon, et al. (eds.) South Africa and the Communist International: A Documentary History. 2 vol. 2003. Degras, Jane T. The Communist International, 1919–43 (3 Vols. 1956); documents; online vol 1 1919–22; vol 2 1923–28 vol 3 1929-43 (PDF). Firsov, Fridrikh I., Harvey Klehr, and John Earl Haynes, eds. Secret Cables of the Comintern, 1933–1943. New Haven, CT: Yale University Press, 2014. Riddell, John (ed. ): The Communist International in Lenin's Time, Vol. 1: Lenin's Struggle for a Revolutionary International: Documents: 1907–1916: The Preparatory Years. New York: Monad Press, 1984. Riddell, John (ed. ): The Communist International in Lenin's Time, Vol. 2: The German Revolution and the Debate on Soviet Power: Documents: 1918–1919: Preparing the Founding Congress. New York: Pathfinder Press, 1986. Riddell, John (ed.) The Communist International in Lenin's Time: Workers of the World and Oppressed Peoples Unite! Proceedings and Documents of the Second Congress, 1920. In Two Volumes. New York: Pathfinder Press, 1991.